With a lot of advanced and technical as well as handy massaging devices available nowadays, you can now make your home a complete spa. This little relaxing area in your home offers the more comfortable experience even without spending much more pennies than you spend in the expensive spas. 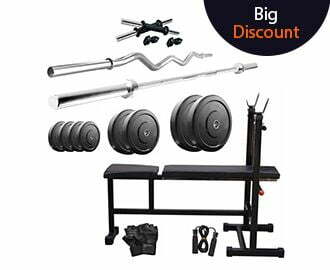 Ranging from Body Massagers, Facial Massagers, Facial sauna devices, and a lot more, all you can buy very easily at the very cost-effective prices to make your home spa a wonderful place. But wait, Don’t you have the foot massager to massage your tiny feet? Welcome to this blog, where we have gathered the best ever Foot Massagers for getting a relaxing foot and leg massage from the comfort of your home. In our daily schedule, we almost work long shifts on our feet or walk around, and also most of us go regularly for the athletic and workout sessions. And the end of the day, it feels crampy and achy legs. But sometimes, a hand massage is not enough to relieve those severe cramps on your feet. And here comes the role of Foot Massagers that you can use very easily to get relax from the hectic all day around. Whether it may be the foot fatigue, swelling, aches, and cramps in your feet, our best picks of foot massagers will do a magic to make you relax in no time. So let’s dive into the list of our five top picks of foot massagers. Whenever you go to purchase a product, it is better to go through the product specifications, ratings, your budget, and of course the buyer’s feedback. It makes you choose the very best option according to your need and preferences. So for your ease and convenience, we have reviewed the best models of foot massagers on the basis of their specifications, and buyer’s feedback. Just go through our full reviews of each models of foot massagers based on customer feedback, to make your pick absolutely the best. 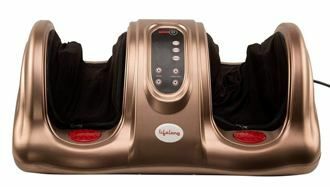 For a perfect foot massage, this one foot massager from Lifelong is absolutely a great buy and therefore comes in the top of our list. It comes with the customized heat operation that promotes the deeper muscle relaxation and even makes you to get rid of the sprain pains. Its speed and steering are easily adjustable so you can use it according to your preferences. The simple, convenient, reliable, and durable design of this machine makes it a perfect choice for everyone who needs an effective foot massage. The very best part is that it works on the principle of reflexology that combines with heat and offers a special massage to stimulate the nerves. 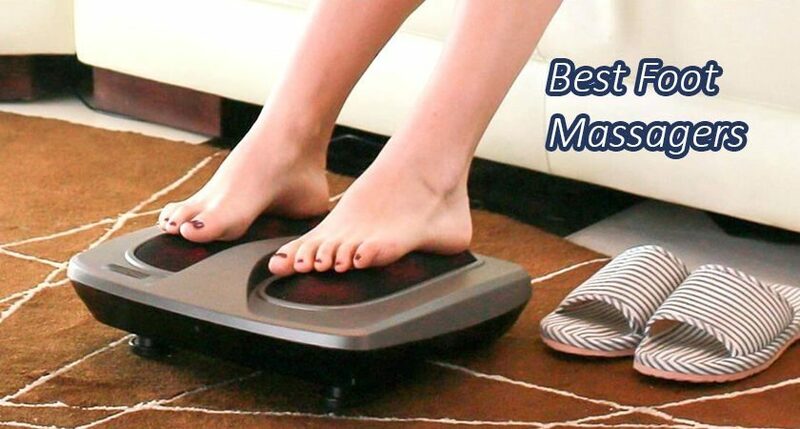 So, live stress-free lifelong with this foot massager. 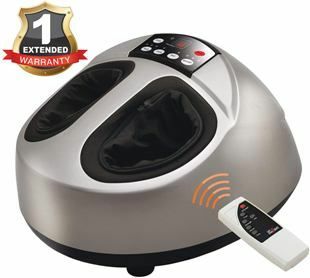 Get a soothing relax from the achy and tired feet using this electric shiatsu foot massager machine from Dr. Physio. This pain and stress relief foot massager with vibration comes along with kneading, rolling, and heating function to reduce pain and stress from the muscles. You can choose these modes according to your need to get the maximized benefits. With the integrated speed control system, you can also easily adjust the speed of massage accordingly. The machine has an anti-slip rubber bottom to enhance the grip on the floor and even all kind of surfaces to avoid slips and falls. You can also use this foot massager machine both indoor and outdoor without worrying about accidents and injuries. 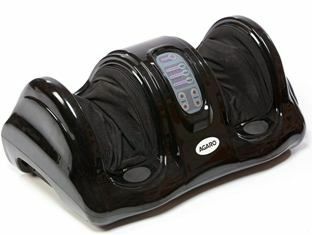 Boasting great performance and quality, this foot massager from the brand Agaro is a great purchase for all your foot massage needs. It completely imitates the ancient Asian massage and reflexology therapies for an effective pain relief, muscle relaxation, and improving blood circulation. This foot massager machine is equipped with magnetic therapy to squeeze and massage your tip of the toes, arch, and sole of the feet through a blend of magnetic science and foot therapy for ultimate relaxation. Also, it comes with touch button that provides you an easy access to this machine. This is another best model of foot massagers from the brand Lifelong that helps people with sore feet and need regular kneading for comfort and relaxation. Its square shaped design with vibrant color makes it more eye-catching. It is based on the reflexology technique by working upon the different nerves in feet that circulates the blood to these nerves. And thus, helps to relieve muscle tension, aids better blood circulation, and also relieves back pain, shoulder pain, arms, and other parts. This foot massager machine has an operation customization feature that lets you decide which body part to focus on. And, you have the option to choose among different programmable options. Also, the speed and steering control feature makes it very easy and convenient to use. You can definitely enjoy the relaxing benefits of a professional-quality foot massage right in your own home spa every day with this foot massager from Sterling. This easy to handle device with remote control performs very well in getting rid of the pain and stress, relieving fatigue, and achieving all goals toward a healthy body. It comes with the customized operations letting you decide which body part to focus on. And so, it is a great and effective foot massager machine for poor blood circulation, diabetics, arthritis, Plantar Fasciitis, ankle, heel, calf & leg muscles. This is all about our best picks of foot massagers to get the instant relief from the achy and soring leg, and feet. All these models work on the pressure points on the sole of your feet and offer you the most relaxing state and reduce strain on legs. I am sure the list we have made for the best foot massagers will help you in picking out the absolute one of your preferred choice.